What we have here is a group of the world’s most powerful countries, plus others such as New Zealand, ganging up on the “Jew of the Nations,” Israel. After passing the perfidious resolution, the Security Council’s members all applauded themselves for the great breakthrough. Because of the “importance” of this resolution, the Security Council had no time to vote on anything having to do with the real problems in the Middle East, such as the brutal war in Syria. Priorities, you know. And when did this all take place? During the Jewish festival of Hanukkah, which celebrates the victory of the zealous Hasmonean Jews against the Greeks, the superpower of the world in those days, including among their ranks the assimilated Jews who renounced Judaism for hedonistic Greek culture. The immediate cause of the war was the desecration of the Holy Temple in Jerusalem and the prohibition against learning Torah and performing the rite of circumcision, in other words, the destruction of Judaism. This travesty comes just a year after the surrender of the West to the nuclear ambitions of Iran, which not only declares its intention to destroy Israel (Judaism is okay though), but also intends to topple the US. This triumph of the successor to the Persian Empire was accomplished in full daylight, with the powerful Western world acceding almost totally to Iran’s demands. The agreement (purposefully not a treaty, which would have required Congressional approval) doesn’t proscribe the continuation of Iran’s production of atomic weapons delivery systems or forbid Iran’s continuing support for a myriad of terror groups plaguing the Middle East and other regions. Some deal! And when did that take place? During the Jewish festival of Purim, which celebrates the victory of the Persian Jews against Haman, the Jews’ wicked enemy, royal vizier to King Ahasuerus/Achashverosh, ruler of the world’s greatest empire. Do we sense a pattern here? The Western world is roiled by a catastrophe emanating from the Middle East, but not one that in any way originates in Israel. The damage is vast: a half million dead in Syria alone; half of Syria’s population displaced; millions of refugees (mostly young males) inundating Europe and other Western countries; the Arab states surrounding Syria violently disrupted, with Western ally Jordan teetering; Turkey, the only Muslim member of NATO, allied with NATO’s adversary, Russia; and Russia now the kingmaker in this vital region. Yet, Israel is an island of stability. Evidently, the Palestinian Arabs are the most important people in the region, because the whole world is hardly concerned with the above morass. Instead they’re fixated on carving a country out of the Land of Israel for the “State of Palestine.” To accomplish this, the one worldwide organization purposed to prevent wars and promote progress, spends a huge proportion of its time to castigate Israel (obviously the evil empire behind all this turmoil, as foreseen in that influential tome, The Protocols Of the Elders of Zion, probably the most significant forgery in history). So, the Palestinian Arabs must have their own state. How are they doing with their present mini-state, Gaza? Not too bad, if you don’t mind having a “government” which keeps the Gazans poor, terrified, unable to leave their country, subject to forced labor in Hamas tunnels, and not to be overlooked, available at any time to be used as human shields for the grand purpose of Hamas: the replacement of Israel by a Muslim caliphate. The Fatah organization, the rulers of the PA (Palestinian Authority) aren’t much better. No elections, no upgrading of sewage and water installations (because that would required cooperation with Israel), no preparation at all to be a functioning state. They’ve rejected incredibly generous (I say stupid) offers fulfilling nearly all their demands for a state. The reason: they don’t want a small country, they want to take over and replace Israel with a Palestinian state. Issacharoff, no right-winger, knows what the majority of Israelis know, that for the foreseeable future, maybe never, the Palestinian Arabs can’t be trusted with a state because it would endanger Israel’s existence. The United Nations constituents don’t know this, or they do know it, and approve of it. There is a dearth of imagination about what to do with the situation of the Palestinian Arabs. The “2-state solution” is unviable, and the so-called 1-state solution, with Israel ruling all of the Land of Israel, may or may not be feasible. It’s time to stop the mantra of 2 states and devise practical, alternative solutions, many of which have been proffered. Clearly, Israel cannot agree to a “solution” that would eventually lead to the end of the Jewish state and the slaughter of its citizens. Because the Palestinian leadership refuses to negotiate peace and continues to advocate conquest of the entire Holy Land, like it or not, Israel must for security reasons remain in control of the “West Bank.” However, there’s no reason that even under today’s current impasse the Palestinians should not have full autonomy — which they almost have today — as an “unincorporated territory.” While the situation is not ideal, until the Palestinians agree to full peace with Israel, providing they do not resume terrorism, they could be welcomed as partners in the Israeli economic system and should be able to fully participate in Israel’s commercial and creative life. Even without statehood, in less than a generation the Palestinians could become the most advanced and prosperous people in the entire Arab world. Steve Kramer grew up in Atlantic City, graduated from Johns Hopkins in 1967, adopted the hippie lifestyle until 1973, then joined the family business for 15 years. Steve moved to Israel from Margate, NJ in 1991 with his family. 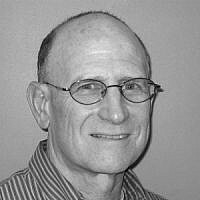 He has written more than 1100 articles about Israel and Jews since making Aliyah. Steve and his wife Michal live in Kfar Saba.